Some time ago Renato IK1QFK sent me a .wav file, containing a recording of the signals coming from his ortholoop, i.e. 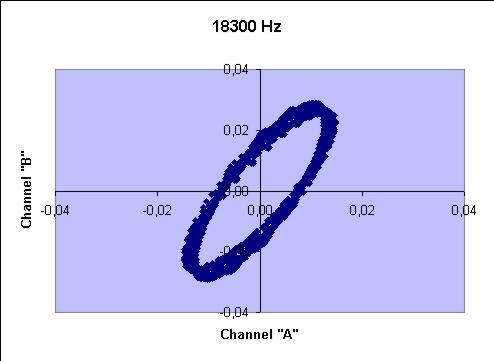 an antenna made by two aerial loops placed at 90 degrees of azimuth each other. Signal recording was performed as usual with a PC sound card, and so it covered only the [0;22050] Hz bandwidth. The interest of Renato (and mine as well) was to try to establish a method for detecting the direction of arrival (DOA) of each signal recorded with this antenna. Renato describes in his web page a method (effective but a bit cumbersome) to process the recorded data with Cooledit. My goal (not very different from Renato's ideas, as I discovered!) was to setup a DSP method that could perform a sort of real-time DOA analysis. The idea I wanted to implement was pretty close to the Watson-Watt RDF method: in this method two antennas with orthogonal radiation patterns pick-up the unknown signal. The antennas are connected to two receivers, whose output are sent (after some integration) to the x- and y- channels of a scope. The incoming signal plots on the screen a line whose azimut is equal to the DOA, apart an ambiguity of +/- 180 degrees. To remove the ambiguity a third omnidirectional antenna is used to blank the unwanted part of the signal on the scope. The drawback of the method is the need for three receivers, that must have pretty well matched phases and gains. The Watson Watt method was modified by multiplexing the signals into one receiver, moving the complexity of the technique from the receiver set to the antenna system. Let us call the two channels I had as channel "A" and channel "B". 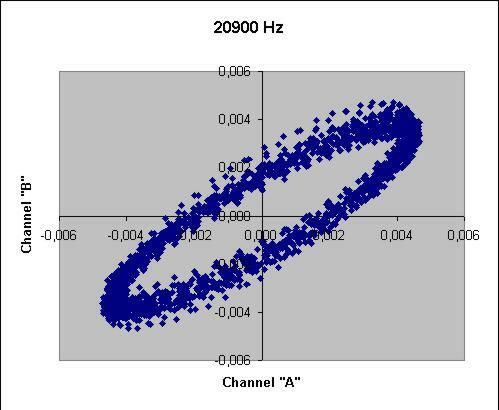 Each channel consisted of 2295608 samples, and the sampling rate was of 44100 Hz. I began selecting some frequencies to analyze, namely GBR at 16.0 kHz, HWU at 18.3 and 20.9 kHz and I could not resist go give a glance also to the ubiquitous 50 Hz... Here you can see part of the power spectrum on the "A" channel. The processing method applied to the signals was very straightforward: channels A and B were filtered with a costant-Q FIR bandpass filter (Q = 100, FIR length = 121 taps), and for each pair of samples I plotted a point on a x-y graph: I expected that the incoming direction could show up as a straight line. In parallel I also computed the direction of arrival fitting a least-square line to the signals, i.e. B = mA + q where B and A are our signals, and m and q are the parameters fitted to the data. 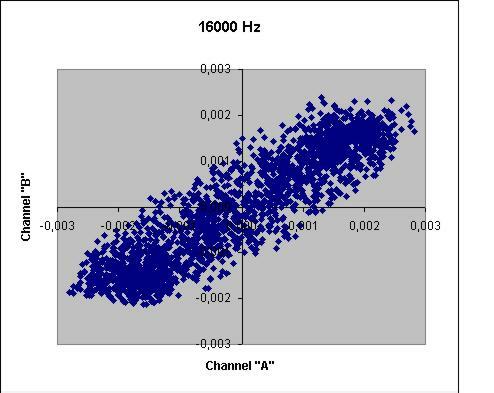 The parameter q takes into account the fact that we expect that our "receiver" could have a DC bias, while from m we can compute the direction of arrival, since DOA = atan(m). ENEL 50 Hz ? ! ? As you can see, the result are quite confusing....let us try to understand something from our data! And now let's give a look at what I measured, what Renato found with his method, and the true DOA. The parenteses in the second column simply add 90 degrees to the measurement, since I did not know the correct orientation of the "A' and "B" channels. I do not know if the dataset received by me was also analyzed by Renato with his method, and if he could repeat the measurements he has shown in his web page. 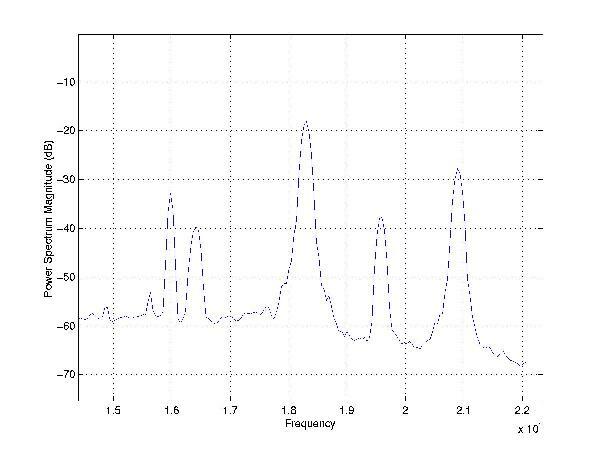 Since HWU (18.3 kHz) is the strongest signal that can be received (see the spectrum), I wonder if the fact that GBR and HWU (20.9 kHz) seem to arrive from the same place could be due to some cross-talk among the two channels. Running some DOA analysis on some points of the spectrum containing nothing but noise, I found more or less the same azimuth of GBR and HWU (20.9 kHz), altough the signal excursion on the graph was quite smaller. Ay comment about this ?!? 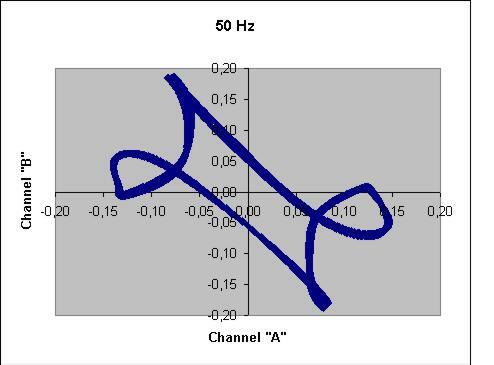 I also tried a FFT-based DOA analysis: it was the same method described above, computed in the frequency domain. Results were very disappointing, and they are not shown here. I will come back to the FFT method as soon as I can properly detect the DOA of HWU and maybe GBR.